The Oklahoma State Department of Education told lawmakers Tuesday it needs $3.4 billion for fiscal year 2020, a nearly $441 million increase. A $480 million boost from special-session legislation last year largely went toward a teacher pay raise averaging $6,100. State Superintendent Joy Hofmeister told lawmakers she's grateful for that, but Oklahoma has more work to do to improve its public schools. "It isn’t going to be 'one and done.' It’s going to require many, multiple steps and a commitment that is enduring with dedicated revenue to accomplish that," Hofmeister said. 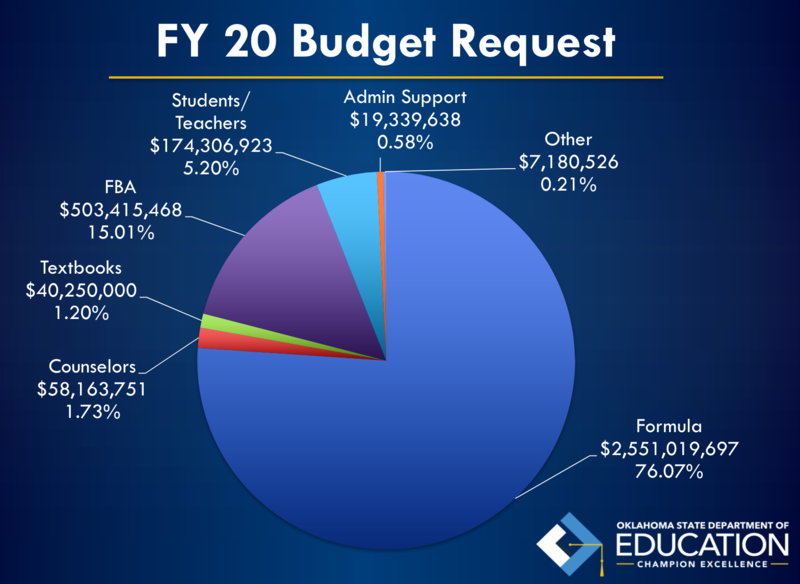 The FY2020 education budget focuses on reducing class sizes. In 1990, lawmakers set maximum class sizes at 20 students in grades one through five, and no more than 140 students in a day for teachers in grades six through 12. Ongoing education funding shortfalls have led to all school districts having exemptions to the limits. "This year, we are asking the legislature to put an additional $273 million into the funding formula," Hofmeister said. "We know we would need this number infused back into the funding formula to be able to hire the teachers that are required to achieve those class-size limits." About $58 million of the requested increase would go toward hiring more counselors. The recommended ratio is one for every 250 students, but Oklahoma’s is one for every 435. Republican Rep. Randy Randleman said he sees the need for more counselors but does not think they can handle all students’ needs. "A school counselor is not trained to handle reactive attachment disorder. A school counselor is not trained to deal with a bipolar disorder or a conduct disorder or a threat, killing a teacher," Randleman said. The education department said licensed professional counselors who can meet mental health needs will be part of the proposed uptick in hiring. The common ed budget also calls for funding increases for early childhood programs, alternative education and reading sufficiency.